The black Digital Holster 10 V2.0 from Think Tank contains a unique "Pop Down" feature that allows the lens hood to be kept on the camera held in shooting position. For the active shooter, this is a real time-saver. The case is made to hold a small DSLR with a standard kit lens. It is also designed to hold the camera with a tripod plate attached to it so you can readily set up for a long exposure shot without delay. This is a form-fitting case, somewhat reminiscent of a western holster - ready to draw and shoot at a moment's notice. The case comes with a side rail attachment that accepts a small Modular, Skin, or Multimedia component. This increases the footprint and capacity of the holster as well as your shooting capabilities. The holster comes with Think Tank's "Rotate or Lock" technology for their Pro Speed Belt, Thin Skin Belt or Steroid Speed Belt that permits you to attach the holster with no effort at all. There's also a smooth fabric on the belt to minimize friction against your body. One of the best features of the bag is that the lid opens away from your body. This enhances access to your gear as well as adding a significant security aspect to the bag since, when opened, the lid acts a shield preventing others from seeing what's inside. The removable shoulder strap and top grab handle are complemented by dual zippers that guard the access to the main compartment. 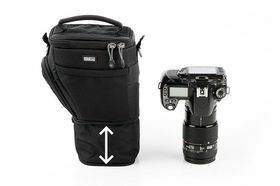 For accessories, a front stretch pocket can hold lens caps, batteries and other small items. Another touch fastened small accessory pocket is located under the top lid that is perfect for holding a filter. For ultimate protection of the delicate LCD screen on your DSLR, a soft divider fits over the top protecting it from the strap that may be stuffed inside. There's nothing like networking so the bag comes with a neat business card holder right under the top grab handle. Finally, for maximum protection while outside, the bag comes with a built-in rain cover that is stored in an outside pocket and which can be easily deployed when the weather turns against you. The holster comes with Think Tank's lifetime warranty against manufacturer's defects.